Another exciting season of Jazz Arts Group Presents shows kicks off for 2017-18 with the acoustic jazz ensemble Rhythm Future Quartet playing two shows at Notes on Thursday, September 28th at 7pm (tickets here) and 9pm (tickets here). 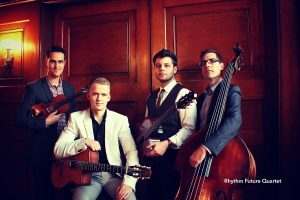 The band, a leading purveyor of the style known as Gypsy Jazz that was popularized by Django Reinhardt and Stéphane Grappelli, is led by violinist Jason Anick and guitarist Olli Soikkeli, with Max O’Rourke on second guitar and Greg Loughman on bass. Named for a Reinhardt tune, the quartet plays both “both gypsy jazz standards and original compositions drawn from diverse international rhythms and musical idioms,” resulting in a sound influenced by the classic Hot Club of France, yet totally contemporary. I had the chance to talk to Loughman (pictured at right) via phone recently and discuss the band’s latest album, influences, and his background in the Columbus jazz scene. Keep reading to learn more. The band’s 2016 album Travels was very well-received. Was there a certain sound you were looking for on the album, or a different approach from the self-titled debut? Greg Loughman (GL): [When the band first formed] Jason had come up with a couple arrangements to play live to get the band off the ground, and at the first couple shows that we did, people kept asking if we had a CD. So we did the arrangements that Jason had written and a couple standards that we all knew, and [the first album] was a fairly “quick and dirty,” off-the-cuff record just to have something to sell at gigs. When we went to do Travels, we had been doing a lot more listening, to different groups in the gypsy jazz genre and outside of it too, just to try and see what we could come up with that was a little more personal in terms of our own vision. So we all contributed – I wrote one song, Max the rhythm guitar player wrote one, Jason wrote a few and Olli wrote a few. So it was mostly originals on Travels, which was kind of more of the idea. And there’s a little bit more involved group decision making in the arrangements, which was really fun to work out. While “gypsy jazz” conjures a rather specific sound, the new album shows a variety of different influences. I was really struck by the title track – Who wrote that one? GL: That one was written by Jason, and that was one of the ones where he had come up with it and he had written a lot of the parts, but by the time we got done with structuring it, it becomes its own thing. There’s a couple groups we had been listening to, like a great French group called Les Doigts de l’Homme, which is doing gypsy jazz but more modern and compositional. We also listen to a lot of Punch Brothers while we’re driving around. So those influences [were present], and Jason has played a lot of modern jazz as well as gypsy jazz, so some of those influences come in. We try to draw from everything. GL: There was a gypsy jazz festival in Chicago – Rhythm Future played [a set] and we also played with another great gypsy jazz guitar player called Stephane Wrembel. So we were rehearsing some songs with him, and between rehearsing one song or the other, I came up with the introductory line and recorded it on my phone. I went back to it later and built a song around that. I had a lot of the two guitar writing together, and [knew that] getting the tempo to kick in a little faster would really feature Jason and Olli well. It’s nice to have a group like this where you can write for the specific people. You can write something based around what you know will sound great for this or that person. How did the group first come together? GL: Jason had been playing for a long time with another gypsy jazz guitar player named John Jorgenson, who is pretty well established in the American gypsy jazz scene. So Jason was the side guy, the “other featured soloist” for John Jorgenson’s band for about 7 years. He had been building his own reputation and wanting to start his own band. He had been teaching at a camp with Olli, the guitar player, who had actually come from Finland to the United States to teach at this camp. So they got together and played, and really hit it off. Olli mentioned that he was thinking of coming to the United States to play here full time, but the first couple gigs that we did were when he was still living full-time in Finland and he would just fly out for a couple weeks and we’d book some shows. Once Olli moved to New York, we kicked into high gear and have done a lot of touring ever since. Your band seeks “to keep the spirit of gypsy jazz alive and expanding.” How do you feel about the general state of the genre in 2017? GL: The American gypsy jazz scene is kind of interesting. I’m coming to it from more of a straight-ahead jazz background. But gypsy jazz has a lot of crossover with the bluegrass music scene, because there’s acoustic guitars and fiddles. So I think there’s a lot of people who like bluegrass that will also get into gypsy jazz, but they might not ever really listen to modern jazz. So it kind of straddles that thing, and there’s a little bit of the “retro” crowd that gets into it as well, like the swing dance crowd or the “Gatsby” people who dress up in the 20’s garb. You see some of those fans at the shows. One of the advantages gypsy jazz has over modern jazz is that it has more hands in other scenes. It seems to be getting more and more popularity in the United States. It’s been pretty popular in Europe since a resurgence maybe around the late 90’s, early 2000’s. But it seems to be surging in the United States too, there’s a lot of bands cropping up and a lot of interest from audiences. How do you feel your job as the bassist changes when there is no drummer in the band? GL: I’ve played in a bunch of different settings without drums, and you always have more responsibility to be very definitive. That’s true of the bass, but it’s also true of the other instruments. One of the things that feels different about gypsy jazz from more modern jazz stuff is that there’s a lot less extended playing across beats and across bar lines. Everyone seems to be a lot more pinpoint accurate in terms of the rhythmic stuff that they’re playing, whether they’re soloing or especially if they’re playing rhythm. There’s a style of playing rhythm guitar in gypsy jazz that’s kind of unique to that style called “la pompe,” which means “the pump” in French, where you’re just pumping out quarter notes. As the bass player, I’m playing quarter notes in my walking bass line, and my job is to lock in with the rhythm guitar that’s also playing quarter note chords. That kind of combination really creates that gypsy jazz sound. That took me a while to really [get the hang of] – I had to do some homework. I hadn’t played much gypsy jazz at all before this band started. So I really had to dive in and see how the rhythm guitar player and the bass player are working together, how are they moving energy, how are they doing all the things that rhythm sections do. It’s a fun style of music once you get into it. What are you and/or the band listening to these days? GL: We’ve been listening to a lot of Brazilian music. The guitar player Olli has actually been sitting in in New York with a bunch of Brazilian cats and learning a bunch of choros. We’ve been digging into that style and trying to incorporate more of that into what we’re doing. Other than that, we’re still listening to whatever we like that’s out there, whether it’s pop music, or jazz, or gypsy jazz, or Brazilian, or whatever. Tell me about your Columbus roots. GL: I grew up in Zanesville, Ohio. Then I came to school in Columbus and went to Capital University. After I graduated, I probably stayed in Columbus for five years or so in the mid to late 90’s. I moved away after that, but a lot of the learning both in school and out that I had, in terms of making me the musician I am today, comes from all of the talented people around Columbus. There’s a lot of great musicians in Columbus. I was just talking to my friend Brett Burleson, the guitar player. We went to school together at Capital, and I might try come a few days early and do some playing with Brett before the Rhythm Future show. I played with him, I played with Erik Augis – we had a steady jam session at Barrister Hall. I would sub for Dave DeWitt on bass every once in a while, or whoever would give me a call to sub for them. I was always happy to do that. It’s a vibrant scene. Anything you want to say to our readers thinking about seeing your Columbus shows? GL: Jason and Olli, the two soloists, are some of the most well-respected players in this genre in the United States. This show will be a good chance, if you’ve never heard gypsy jazz, this will be an excellent introduction. I hope people like it!